Check out these cool photos taken by flickr pro Tom Debiec. They were shot with a Holga camera which gives them this timeless look. 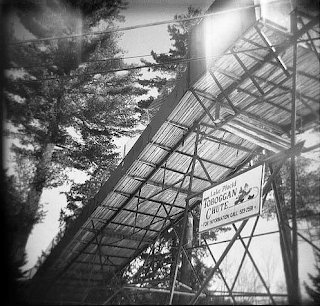 With the colder temperatures having set in, look for the Lake Placid Toboggan Chute to open soon. 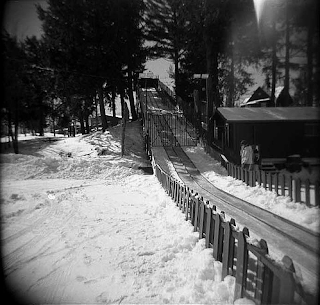 Located across the street from the Lake Placid Post Office on Parkside Dr, the toboggan chute has been in operation since the 60s, sending generations shooting out across the frozen Mirror Lake. A 30 foot high converted ski jump trestle sends the toboggans down ice chutes and out 1,000 feet onto the lake. Toboggans can hold 2-4 people and can be rented at the chute for unlimited rides for 2-4 hours. Dress warm for this winter fun!